The course aimed to introduce open and distance e-learning or ODeL to interested learners. It was designed to provide the key concepts, theories, and principles of open and distance e-learning. At the end of the course, students were expected to differentiate the key concepts in ODeL, trace the development of ODeL and discuss the foundational theories of ODeL and how each influences practice. Since quality is an important aspect of education, the course focuses on quality assurance mechanisms that had been established and are being implemented by various institutions. Basic concepts of quality in ODeL and models of evaluating ODeL were included in the course. Various multimedia resources as well as opportunities for interaction among learners were provided. As basis for certification and to assess and facilitate own learning, assessments were done during the duration of the course. The goal of this course is to explain recent global developments and their implication to higher education, to discuss ODeL as a system and formulate a strategic ODeL vision for an education institution. Modules such as Higher Education in the 21st Century, The ODeL System and Strategic Planning in Distance or Technology-Enabled Education will be presented in the course. The course will introduce the principles and practice of designing for learning in ODeL contexts. At the end of the course, students are expected to explain the meaning and purpose of design for learning, differentiate ODeL course designs, discuss learning principles and processes and design an ODeL learning activity. The course is intended for educators. 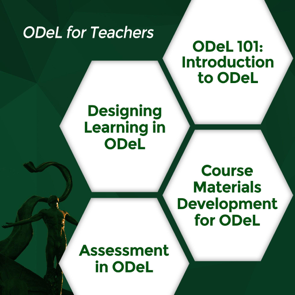 Content Development in ODeL will guide educators through the principles and processes of identifying and curating content and integrating them in a study guide. This course will show teachers how to create learning materials such as handouts, presentation, quizzes and assignments to guide students in their learning. The participants of the course are expected to write learning objectives, select learning resources, design learning activities and write a study guide for a module. This course is about the processes, technologies and issues in the assessment of student learning in Open and Distance e-Learning (ODeL). After completing this course, you should be able to explain the process and technologies of the assessment of learning in ODeL, and discuss issues in the assessment of learning in ODeL. 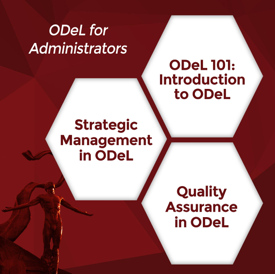 The course will discuss how to provide an effective learner support in ODeL institutions. At the end of the course, students are expected to define learner support, explain its different types, and evaluate the relevance of learner support in the digital age. 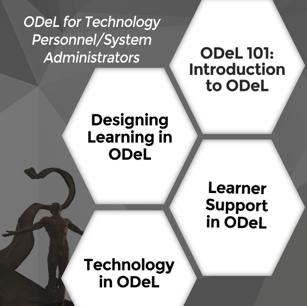 Technology in ODeL aims to help learners use different technologies in handling and facilitating Open and Distance e-Learning. A well-known Learning Management System called Moodle is introduced in this course. Other technologies for managing classes and developing materials are also discussed.